Efficient Quiver: appears to be a typical arrow container capable of holding about 20 arrows. It has three distinct, nondimensional portions. Once the owner has filled it, the quiver can quickly produce any item she wishes that is within the quiver, as if from a regular quiver or scabbard. The efficient quiver weighs the same no matter what’s placed inside it. 3. Spears/bow (6 objects of the same general size and shape as a bow (spears, staves, or the like). Nitram grew up in a small village in Land’s Edge, farming and hunting with his parents and younger brother and sister. His father, Casod, was a human mercanary who met his elven mother while on a raiding assignment. After that meeting, his father gave up his hired sword and moved his small, growing family away from both humans and elves. He thought Land’s Edge was the perfect place to get away and start a new life. Which he did, inserting himself into the village leadership heirarchy, eventually becoming one of the village elders. During this time, his father became very close with an elf named Badar-Ren, who was living out his twilight decades in peace and tranquility, away from major urban centers. 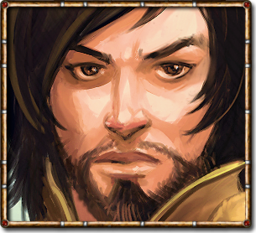 Bandar-Ren had spent the majority of his life brokering peace between elves and man and attempting to resolve other disputes throughout the kingdoms. Bandar-Ren and Casod became very close and Bandar-Ren spent a lot of his time with the Tam family, discussing the religions, cultures, and philosophies of the kingdoms and the differences between them. They all worshiped together at the temple dedicated to Rillifane Rallathil. That is…until the ogres came. Nitram returned from a hunt one evening, the sun’s glow on the horizon competing with the fires burning throughout his village. His village destroyed, his family slaughtered, his temple in ashes and his life gone forever. So began his ogre hatred. He made his way to Highkeep and eventually to Falconaire, where he wandered the countryside villages, eventually joining the guard to protect others from the ogres.